Given that faith and belief in God is one of the central tenants of Christianity, we who call ourselves Christians should have enough faith and belief in God to merit being called people of faith. And yet, when we step back and look at ourselves honestly, it is quite amazing how we who call ourselves Christians will believe most everything we can see with our natural eyes or hear with our natural ears…even when God doesn’t want us to believe it…even when God is asking us to believe for something better. On the flip side, we who call ourselves Christians won’t hardly believe anything that God wants us to believe unless we can see it with our natural eyes or hear it with our natural ears. But, if we wish to be true men and women of faith and belief…if we wish to be the kind of Christians who please God…then we must make that transition to where we do not believe everything we see with our natural eyes or hear with our natural ears…and we do believe for things we cannot yet see with our natural eyes or hear with our natural ears. As the Bible tells us in Hebrews 11:6, “But without faith it is impossible to please [God]: for he that cometh to God must believe that he is, and that he is a rewarder of them that diligently seek him.” Bluntly, God requires that we have faith in Him. Disbelieving what what one can plainly see with their natural eyes…or hear with their natural ears…is not a natural thing…nor is believing what one cannot see or hear a natural thing. But, the things of God are not “natural”. God is a Spirit (John 4:24) and therefore, the things of God are “spiritual”. Correspondingly, a key part of our Christian development and growth is transitioning out of our “natural” humanistic perspectives, responses, and approaches…and into the “spiritual” perspectives, responses, and approaches that God has ordained for His people. Over and over throughout the Bible, we read about God being frustrated with people because no matter what He did or how much He did for them, they still refused to have faith and belief in Him as a loving Father and Almighty God. Moreover, God tells us again and again throughout the Bible to have faith and belief in Him. In Mark 5, we read about a man named Jairus who had the faith and belief to believe that Jesus had the anointing of God and that He was therefore able to heal his dying daughter. So, Jairus approached Jesus and besought him to come lay hands on his dying daughter so that she would be healed. No doubt, words could not have fully described how thrilled, relieved, and grateful Jairus was when Jesus agreed to go with him to lay hands on his daughter and heal her. But, as Jesus was going with Jairus, there were circumstances and conditions that caused delay after delay. Undoubtedly, Jairus became more concerned, more anxious, and more impatient with each delay that he and Jesus encountered. After all, it was his daughter that was at home dying…and there simply wasn’t any time for delays or hold-ups. Probably, Jairus felt increasingly frustrated as he watched other people interrupt he and Jesus’s progress. To add insult to injury, some of those interruptions were other people getting their healing…the very thing Jairus was wanting for his own daughter…but wasn’t getting because of all the interruptions and delays. Most likely, with each delay, Jairus felt more and more fear creeping up inside of him…fear that he and Jesus were not going to make it in time. And sure enough, just as he and Jesus were about to resume their journey yet again, a friend showed up with the news that his daughter had died and that there was no reason for Jesus to come to his house. And in that moment, Jairus put complete and total faith and belief in what his natural ears heard! Fortunately for Jairus and his daughter, Jesus DID NOT put his faith in what he saw or heard in the natural. Rather, Christ’s faith was in God Almighty and in the power of the Holy Ghost. Christ understood that when it comes to the power of God, what a person sees with their natural eyes or hears with their natural ears is immaterial. Jairus, don’t be afraid of what you see or hear in the natural. Instead, be a man who has a spiritual mindset. Be a man who has more faith and belief in God (and His desire to manifest Himself and His Spirit to you and your family in whatever you need) than he has in what his human eyes or ears say is true. Jairus, instead of zooming in on what you see or hear in the natural, have the faith and belief in God to remember that He is our Father God who is in Heaven…and His name is hallowed. Jairus, remember that our God and Father is in fact Jehovah-Jireh…the Lord who provides (Genesis 22)…He is in fact Jehovah-Rapha…the Lord who heals (Exodus 15)…He is in fact Jehovah-Nissi…the Lord who is our banner (Exodus 17). Jairus, remember that nothing is too hard for God. Remember that He can raise a person up out of death just as easily as He can heal a person of their sickness. Jairus, God was LOOKING for someone with a clean heart and a right spirit that He could do great things for…and today, He saw YOU as a person He could do great things for. So Jairus, don’t lose your faith and belief in God just because of what you happen to see or hear with your natural eyes and ears. Instead, LET’S KEEP GOING…YOU AND I…LET’S GO ALL THE WAY TO YOUR HOUSE…LET’S GET TO WHERE WE CAN LAY HANDS ON YOUR DAUGHTER AND PRAY FOR HER…LET’S HAVE THE FAITH AND BELIEF TO KNOW THAT IN SPITE OF WHAT IS INDICATED IN THE NATURAL, YOUR SPIRITUAL GOD ALMIGHTY IS READY TO WORK ON YOUR BEHALF! Jairus, let’s keep going in faith and belief in God’s goodness towards YOU…and His desire for peace in YOUR life…and let’s find out what kind of amazing testimony God is going to give you today in your life, in your family, and for all your friends and acquaintances. Does the preceding paragraph cause you to feel a greater faith and belief in God? Does the preceding bring tears to your eyes? Does the preceding make you want to shout? Well, it ought to because it is the truth of God’s Word…it is the truth of God’s perspective and attitude towards us. So, what is our takeaway here? It is this: before we jump off into believing whatever we see or hear in the natural, let’s check in with God through prayer and Bible reading and see what He would have us to believe spiritually! Let’s make that transition to where we do not believe everything we see with our natural eyes…when God wants us to have the faith to believe for things that we cannot yet see with our natural eyes. Just as Jairus did, let’s KEEP GOING with Jesus as our Lord, Savior, and Redeemer…with full confidence, trust, faith and belief in God and His Spirit to move in our lives for good (Romans 8:28), for our blessing (James 1:12), for a testimony and a witness (Philippians 1:12), and ultimately, for eternity in Heaven with Him (James 2:5). And, while we are walking with Jesus…and urgently needing our prayers answered…if we find ourselves encountering obstacles, setbacks, hold-ups, or delays…let’s just renew our strength…let’s keep on running and not be weary…let’s keep on walking without fainting (Isaiah 40:31)…let’s hold to our faith and belief in God…KNOWING that OUR day of deliverance and victory will assuredly be given to us. 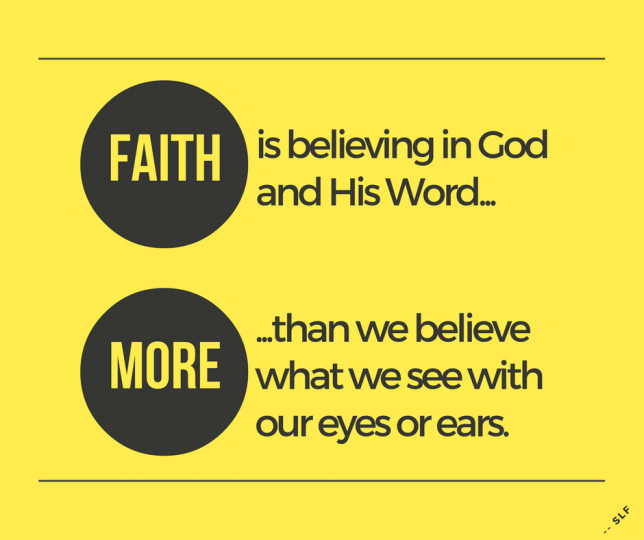 Faith And Belief: It is time for us Christians to actually believe in God like we say we do.